Originally known as Haslem's Creek Cemetery and officially called the Necropolis, Rookwood Cemetery now stands in the centre of suburban Sydney on more than 777 acres. Over one million burials are believed to have taken place since it was opened in 1867, making it widely regarded as the largest cemetery in the southern hemisphere. It quickly became the most important burial site in Sydney. Earlier cemeteries included the Old Burial Ground established in 1792 at Cathedral Close (now the site of Sydney Town Hall) which officially closed in 1820. The Devonshire Street Cemetery (aka Sandhills or Old Sydney Burial Ground) had opened in 1819, but was overcrowded by the early 1840s.Haslem's Creek, 11 miles from the centre of Sydney, was chosen as an ideal site for a new cemetery, easily accessible by both road and the Sydney-Parramatta railway line. It was designed as a grand garden cemetery of the Victorian era, along the lines of, among others, Kensal Green, in London. In its heyday, it had a reputation as an ideal outing on weekends for families who would visit by train to enjoy its gardens, gazebos and serene atmosphere. A mortuary station was built at Redfern and a Receiving House within the cemetery, both sandstone buildings being designed by the Colonial Architect James Barnet. Passengers were charged a modest fee but coffins travelled for free. With the advent of motor hearses, the line into Rookwood closed in 1948 and the sandstone Rookwood Receiving House was sold and transported in 83 semi-trailers to Canberra, where it began a new life as the All Saints Church of England in Ainslie. The first burial at Haslem's Creek Cemetery was reported to have taken place in 1867, when John Whalan, an 18 year old pauper Irishman, was buried there on 5 January. However, no official record survives of this interment. Local residents of Haslem's Creek objected to the cemetery bearing that name, so it became known as Rookwood. In no time at all the surrounding area also became known as Rookwood, defeating the purpose of the name-change. Today, Rookwood remains an oasis within the greater Sydney metropolitan area, surrounded by housing, light industry and busy roads. It is run by the Rookwood Necropolis Trust (Joint Committee) with eight distinct administrative sections and has a Crematorium and cafe. The Friends of Rookwood Group, which grew out of the SAG's transcription team, runs regular historical tours and open days. From the mid 19th and 20th centuries Rookwood was the main burial ground for Sydney, with sections set aside for all denominations. The database contains more than 233,000 names. While some of the cemetery Trusts within Rookwood have now made their burial registers available online through their own websites, these transcriptions are of immense research value as they often contain, in addition to name, date of death and age, details such as occupation, place of origin, religion and cause of death. Family relationships can also be established where multiple names appear on a stone. Bea Miles (1902-1973) - eccentric Sydney identity in the 1940s and 1950s, who had an extraordinary knowledge of Shakespeare and could quote it at length. It is said she once hired a taxi and asked the driver to take her to Perth (a distance of almost 4,000 kilometres). He did and she paid the fare! Mei Quong Tart (1850-1903) - a leading Sydney businessman and philanthropist who ran a chain of highly successful tea shops and restaurants in Sydney. He was renowned as an excellent employer, whose staff enjoyed paid sick leave and many other entitlements unheard of at the time. Quong Tart died after surviving a savage attack by an intruder in his office at the Queen Victoria Market and his death was widely lamented. His funeral at Rookwood was one of the biggest ever known in Sydney. Jacob Pitman (1810-1890) - brother of Sir Isaac Pitman who invented Pitman's Shorthand. 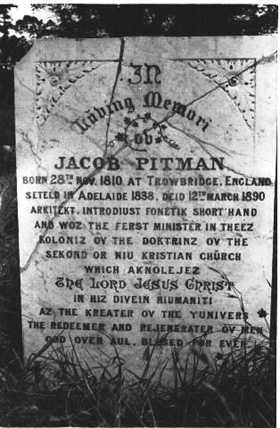 His epitaph is inscribed in phonetic shorthand and begins 'in luving memori ov Jacob Pitman b.28 Nov 1810 at Trowbridge England, Seteld in Adelaide 1838, deid 12 March 1890. Louisa Lawson (1848-1920) renowned suffragette and newspaper proprietor, was born near Mudgee in NSW on 17 February 1848. She married Norwegian-born Niels Hertzberg (Peter) Larsen a goldminer. Their first-born child was Henry Lawson, noted Australian short-story writer and balladist.David Scott Mitchell (1836-1907) was the benefactor of the Mitchell Library in Sydney. He was an avid book collector who aimed to collect a copy of any item which related to the history of Australia. Following his death his entire book collection together with a substantial legacy was left to the state. The Mitchell Library today contains the majority of Australia's most important historical documents and is one of the finest library collections in the world. Please note: The Society of Australian Genealogists has a number of useful section maps available on its website which will help to determine the location of a gravesite. Where no plot number is shown, refer to the record for the first listed associated person where these details will be found. This is a great genealogy tool for anyone with ancestors in central Sydney.